Whatever you do, don’t look at that smokestack! Do, and next thing you know you’ll be drawing a knife across your throat. Suicide! Or so says the press and John G. Spangler, M.D., M.P.H., a professor of family medicine at Wake Forest Baptist. 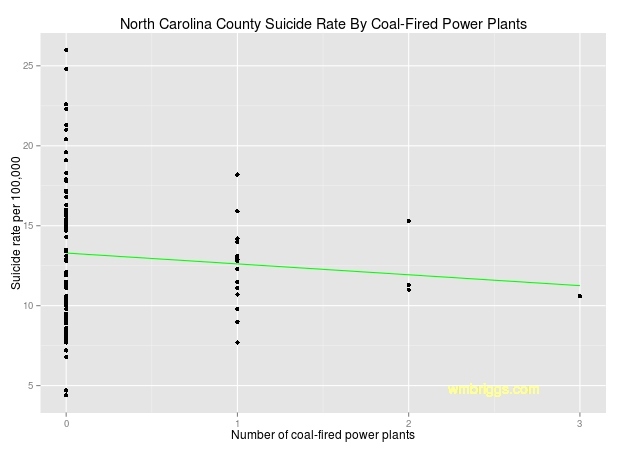 The good doctor used a statistical model to “prove” that if you live in a North Carolina county which has a coal-fired power plant, the chance you will kill yourself—from disgust, despair, or moral desuetude we never learn—increases significantly over a county which has none. Yes, and if you live in a county which has two such power plants, look out! Death lurks on every erg. That you should find yourself surrounded by three such institutions does not bear thinking. Yet we must and will. “It is hypothesized that suicide is related to having a coal-fired plant in a county, acting as a substitute measure of air pollution.” How do these ordinarily life-giving buildings (try living in North Carolina without air conditioning) encourage dark forces? Possibly by causing “abnormal cognition, neurological development or degeneration” and lowering “overall life satisfaction” you see. Here is what Spangler did. He gathered county-level suicide rates and various demographics, such as percent whites, median income and the like, and counted the number of coal-fired power plants. He also took genuine air-quality measurements of metals and other pollutants, which was wise. He then “regressed”, i.e. used an unnecessarily complicated statistical model, the suicide rate and the other variables together. The flaw should already be obvious, and glaringly so, to those who know statistics. For those who don’t, stick around. Even accepting the (hidden as yet) fallacy, there were some oddities about Spangler’s work that jumped out. He claimed that in North Carolina “sixteen [counties] had one plant; three had 2 plants (Gaston County, Halifax County, and Robeson County); and one had 3 plants (Person County)” This is 20 counties with 16 + 6 + 3 = 25 plants, which means 80 counties did not have any coal-fired power plants (NC has 100 counties). Spangler did not list the sixteen counties with just one plant. However, Sourcewatch a most progressive organization, has a list which appears complete, and from these we can infer the missing counties. See the tables below for details. The suicide rates per country were also not in Spangler’s paper, but the CDC: 2003-2010 Final Data has them. Here is a plot of number of coal-fired power plants by the the county-level suicide rate. The median suicide rate for counties empty of coal-based electricity was 12.9, which was the identical rate in counties which had one plant. For those three—and only three—counties which had two plants, the median was 11.3. In the one county which had three plants, the rate was 10.6. The green line is the “regression” of these two variables, which seems to indicate that increasing the number of plants decreases suicide rates, the exact opposite conclusion of Spangler’s. Seems that adding coal plants is good for you! How can this be? Easy. For one, Spangler’s data could be slightly different because suicide rates change from year to year (my rates are aggregated from 2003-2010, and Spangler says his are from 2001-2005). But if that’s true, and because the number of coal plants in each county hadn’t changed, it means the data is too variable to draw any conclusions. It’s also suspicious Spangler doesn’t have a plot like this in his paper. For another, regression does funny things to data, making lines which should go down, mysteriously go up. Especially when you toss an enormous number of variables at it hoping something will stick. And the more variables you throw, the more likely something will stick, even absurd things. Note that none of the actual environmental variables Spangler used showed up. These are the variables which could actually influence health, and yet all were unimportant. The model itself is silly: there are only three counties with two plants, and one with three, yet Spangler (and I above) drew a regression line over this wee sample. But the mathematics doesn’t know this, so it will give a result. My green line is just as absurd as Spanger’s: there just isn’t enough data about increasing the number of plants to say anything cogent. And then there’s the fallacy hinted at above. It occurs when people infer individual-level conclusions from aggregate data. Something, or many various things, caused the differences in suicides between counties, but it does not follow that because a correlation was found in a statistical model that the variable identified had any causative effect. If that were so, then moving to a county which had a higher proportion of whites or older folks would increase your suicide risk. That is obviously ridiculous, but if we follow the press reports and Spangler’s breathless intimations, that is the conclusion we would reach. We should be especially suspicious here because no pollutants were noted, nor were any of the other demographic variables, like income and education. The county-level is just too crude a scale to be useful. The many journalists who picked up this story should have recognized this, as should have Spangler: a simple plot (like the one here) would have showed him his task was futile. Tables of the data in Spangler’s paper, given in case my counts differ from his. The suicide rates for counties with no plants were taken from the CDC. Semora is an unincorporated town located partly in Caswell county and partly in Person county, which I assigned to Person so that it had 3 plants as indicated by Spangler. The remaining 80 counties had suicide rates from 26.0 to 4.4. Excellent and another example of Briggs (and other scientists) who still clings to ethics and fundamentals of science to expose nonsense/non-science that has dubiously attempted to be passed off as something serious. It occurs to me, and it’s very unsettling, that Dr. Spangler could have had his eye on a politically correct and convenient conclusion long before any analytical notations were gathered…and I could easily imagine he may have been dreaming of big bucks funding from any number of ethically lacking federal and state agencies for his most curious conclusions. For the present, I’m going to force myself to think that’s not the case, but it is very worrisome. “Peer-reviewed”, right? Another hit on the idea that peer-review means anything other than my pal at the journal agreed to publish my study. The real moral of this story is that coal fired power plants give chemophobes apoplectic fits. The chemophobes that I know move far away from the plant, not kill themselves. Maybe that is not enough? The plants have to go or the fear cannot end? Don’t fear. The EPA will save us. Under new EPA regulations coal fired power plants will be illegal. Most of the chomophobes I know aren’t smart enough to know what a coal fired power plant looks like. They don’t really kill themselves, they wait until someone tells them how close they are to a coal fired power plant, then they have such a fit that they suffocate because they can’t stop screaming in fear long enough to breath. Because they die of asphyxiation and their is no sign of strangulation, it gets ruled a suicide. It seems like a big issue is that counties with fewer coal plants are likely to have a lower population (less need for power), so their suicide rates (or any relatively rare annual rate of anything) will have high variance. This is part of the reason why, as the number of coal plants increases, the range of suicide rates decreases, and the county with 3 plants has a rate that is about at the median. It seems like if the researcher wanted to include coal plants into the analysis, he would need to adjust it for population (like coal plants per capita) at the very least, and perhaps use partial pooling to account for small counties. The green line is the â€œregressionâ€ of these two variables, which seems to indicate that increasing the number of plants decreases suicide rates, the exact opposite conclusion of Spanglerâ€™s. Based on the scatter plot shown in this post, a linear regression of suicide rateon number of plants would result in a high mean squared error and therefore probably a conclusion of no significant correlation or negative trend. Just a guess. BTW, aggregating data is usually considered a waste of information in statistics. I look at your chart Herr Briggs and wonder how in the hell your peers manage to stay in business. The modern world seems to be absolutely filled with folks that ponder the seventh significant digit, watching it change completely ignoring the 1st and 2nd digit. As soon as the average was calculated and extremes on the “no plant here” front seen, they should have published the paper saying “Nothing to see here”. That being the only real information that should ever really be published in the world of Epidemiology. Every study done has lots of data with no p value of significance. It is all of those results that are actually useful. They show us what isn’t there. What isn’t there is the real goal of science. Thank you for another fine, sensible, assessment. A significant unmentioned matter is that the study’s author apparently is assuming that “coal pollution affects” are magically constrained to stay within county boundary lines. Considering that some plants are close to said lines, how is that possible? It would be interesting for someone to investigate the exact mechanics of the “peer review” process that transpired here.